Courtney Vandersloot debates the pass as Layshia Clarendon defends. 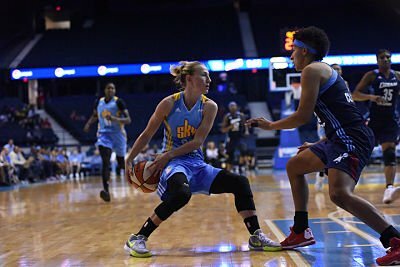 Photo courtesy of Chicago Sky. As the weekend came and went, so did round two of the 2016 WNBA Playoffs. And when all was said and done, it was the Phoenix Mercury and Chicago Sky that punched tickets to the semifinals. The eighth-seeded Mercury pulled off their second upset in a row, taking down the No. 3 Liberty, and the fourth-seeded Sky, matched evenly with the No. 5 Dream, pulled off the win without their top scorer. Saturday saw Phoenix visit Madison Square Garden. Despite being the playing on their home floor, New York could not keep up with Diana Taurasi and the Mercury, who lead for nearly the entire game. Liberty guards Tanisha Wright and Sugar Rodgers hit back-to-back three’s to bring the team within two points, with 4:35 remaining. But Phoenix went on to score the next four points before Taurasi sealed the victory at the free throw line to ensure the 101-94 victory. Taurasi lead four Mercury players in double figures, with 30 points. Tamera Young scores over Angel McCoughtry. Photo courtesy of Chicago Sky. On the other side of the bracket Sunday, Courtney Vandersloot and Jessica Breland lead the way for the fourth-seeded Sky in their match up against the No. 5 Dream, scoring 21 and 20 points respectively, in the 108-98 win. Cappie Pondexter added 16 points in a game where every Chicago player notched a made basket. 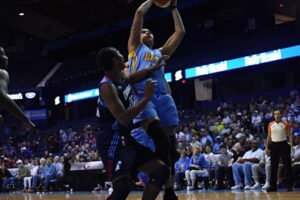 The Sky played without leading scorer and reigning MVP Elena Delle Donne for the sixth game, as she recovers from thumb surgery. 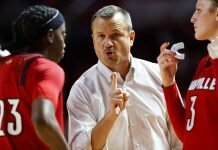 Chicago coach Pokey Chatman credited her squad with true team play. Courtney Vandersloot and Cappie Pondexter celebrate a bucket. Photo courtesy of Chicago Sky. The Sky got off to an early start, opening up a 13-point lead in the first quarter. However, that lead was to be short-lived, as Atlanta narrowed it to six as the first half came to a close. Chicago went on a 10-2 run to start the third period and ratcheted their lead to as many as 19 points. 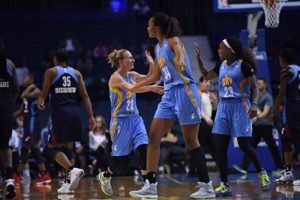 Tiffany Hayes, in her return from a one-game suspension, scored 30 points for the Dream while grabbing six rebounds. Angel McCoughtry added 27. Dream coach Michael Cooper gave credit to Chicago. The best-of-five-game semifinals tip off Wednesday, with the Mercury at the No. 1 seed Minnesota Lynx at 8 p.m. Eastern, and the Sky at the second-seeded Los Angeles Sparks at 10 p.m. Eastern. Both games will be broadcast on ESPN2.